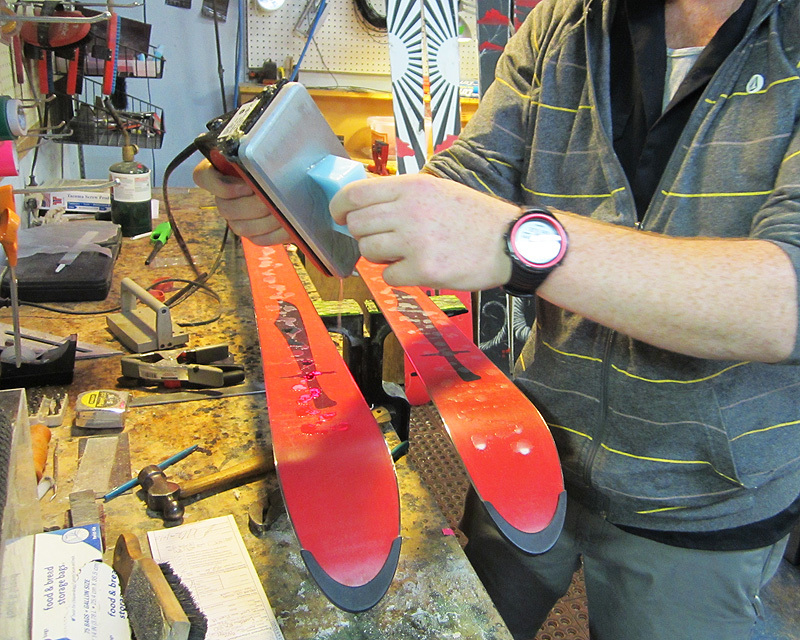 Waxing your skis or snowboard is kind of like riding powder – it’s impossible to do it too much. Waxing on a regular basis not only makes you go faster, it makes turning and handling smoother and more predictable and protects your bases from abrasion. With a little practice, you can master the art of waxing and consistently outrun your partners on the flats or that high traverse to get to the goods. Interested? Different types of wax are applied using different methods. Paste waxes are rubbed on with an applicator and polished with a cork, and can be applied on the hill. Classic cross-country (Nordic) skiers use grip waxes that are designed to provide traction for forward movement but also break loose and glide after a certain speed is reached. Skate skiers use hard glide waxes and don’t worry about grip because their forward momentum comes from the skating action. 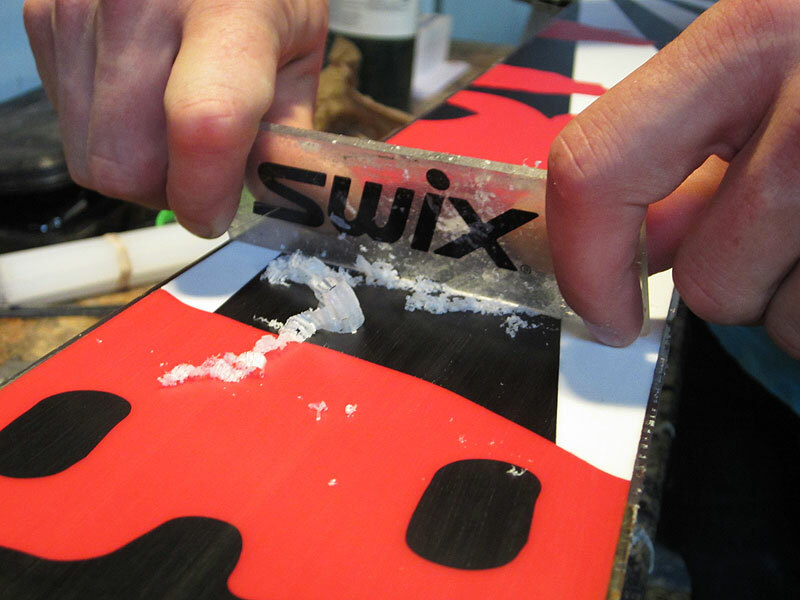 For alpine skiing and snowboarding, we also use “glide” waxes – waxes meant to promote glide and make your bases faster. Glide waxes work by momentarily creating a very thin layer of water between the ski base and snow surface, and their formula varies according to snow temperature and texture. 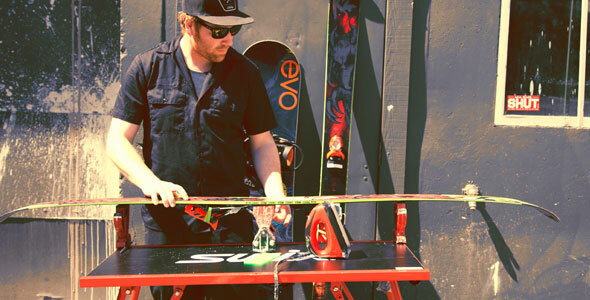 When we talk about waxing skis or snowboards, we usually are referring to hot applications of glide wax with an iron. In an emergency, hard alpine waxes can be applied cold by rubbing on, but for the best performance and longest lasting results, they should be melted on using an iron, then scraped and brushed. If your skis have brakes, retract them before you start working on your skis by pulling them up manually and running a strong rubber band around the brake arms and over the heel piece. This will hold the brakes in “ski” position so they don’t extend below the base. Waxing and other ski and snowboard maintenance is best done with a proper vise that keeps the skis or board level and supports the tips and tails, but it can also be done with blocks of wood supporting the tips and tails, keeping the bindings above the work surface. It’s very difficult not to drip some wax off the skis, so if the surface below you needs protection, cover it before you start. Start with a clean and properly structured base. Make sure the base is flat and the edges are not railed (higher than the base). If your edges or bases need maintenance, do that before you start to wax, and make sure no metal filings are stuck in the base. If your bases are dirty, you can use base cleaner or citrus solvent to remove grime and oil, but use it sparingly and be sure to allow the bases to dry completely before waxing. If you use a solvent, just a small splash on a cloth is plenty. Be careful, base cleaners and solvents tend to remove all residual wax left in your base (you’d like to keep some of this if you can), so skip this step if your bases seem clean. A dry base with visible white areas or obvious “hairs” showing in the P-Tex are sure signs that you need to wax NOW. This base needs wax badly! Clean the surface of your base with Fibratex (also known as Scotch-Brite) to remove old wax and surface dirt. If the base looks very smooth, you can “open up” the structure (create a rougher surface) by brushing with a brass brush and moderate pressure so the P-Tex will absorb wax more readily. Some base materials are better at absorbing wax than others. Less expensive skis and boards and those meant to endure abuse usually use bases made of extruded UHMW (Ultra High Molecular Weight) polyethylene, a very dense form of the plastic that’s durable but doesn’t adhere too well to wax. Higher end skis and snowboards use sintered forms of UHMW, which have a porous structure and are better at retaining wax. Wax is either “all-temperature” or “temperature specific." All-temp or universal wax is designed to work well in any temperature or snow conditions. It may be a good choice if the temperature varies a lot where you ride or if you ski in different geographical areas during your season and can’t predict what the weather will be like. Temperature specific waxes are designed to work best within a certain range of temperatures, providing increased performance that requires a little more effort. Swix “8 Series” (pink) waxes, for instance, are meant for temperatures between 1˚C and -4˚C (34˚F to 25˚F). There is some overlap in the temperature ranges; the next colder wax, the “7 Series” (violet), is for temperatures from -2˚C to -8˚C (28˚F to 18˚F). Temperature specific waxes will still work better than no wax in temperatures outside of their “ideal” range, and it’s possible to combine two temperature specific waxes if you anticipate borderline temperatures. Using temperature specific waxes requires that you follow the weather and anticipate the temperatures you’ll be riding in, and you might find yourself re-waxing if conditions change drastically. Alpine waxes are available in Hydrocarbon (basic), Low-Fluorocarbon (faster), and High-Fluorocarbon (fastest) versions. The increase in glide from adding fluorocarbons to wax can be dramatic, especially in high water content snow, but the price increases are pretty significant, too – users of high-fluoro waxes tend to be competition-oriented and willing to pay to gain a slight advantage in speed. For most recreational use, hydrocarbon or low-fluoro waxes are a good choice. Airborne fluorocarbon fumes and particles have been associated with certain health risks, and PFC’s (perfluorochemicals, the type of compounds associated with ski waxes) have been shown to accumulate in your body over time. If you use these waxes, it’s recommended that you do so in an area with good ventilation and consider the use of a mask or respirator if you work with them a lot. What kind of iron should I use? 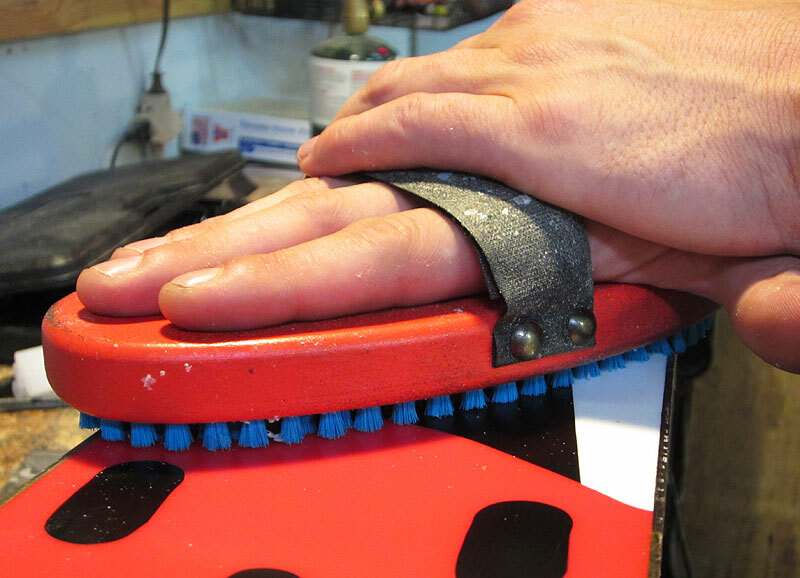 Alpine hard waxes are applied with a hot iron. 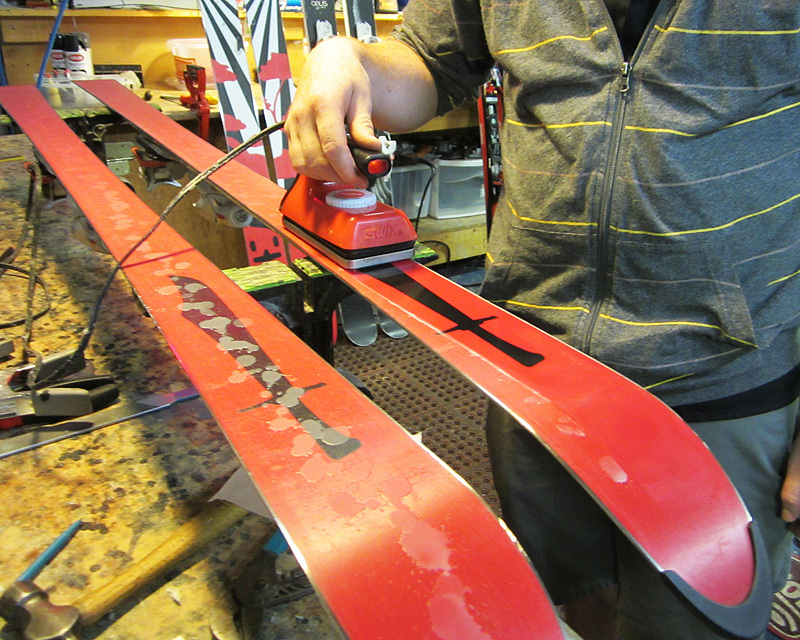 A wax iron is a good investment if you plan on waxing your own skis or snowboards regularly. Wax irons have a fairly narrow temperature band (they don’t get as hot as a clothes iron) and maintain a more consistent temperature. Wax is typically applied at temperatures between 120˚C and 140˚C (248˚F to 284˚F). It’s possible to use your mom’s old clothes iron (don’t use the new one, you won’t be able to get all the wax out, and you’ll be hearing about it for the next thirty years after it drips low fluoro red all over her new blouse) or one from a thrift shop, but be warned: Regular household irons fluctuate in temperature more widely than wax-specific irons and can easily be set at too hot a temperature, causing you to damage your bases. Be careful not to overheat the wax - find a temperature that melts the wax easily but doesn't smoke when the wax contacts the iron. This is usually somewhere around the lower end of the "wool" setting or the high end of the "synthetics" setting. Anything in the cotton or linen zone will be too hot. Using a wax specific iron, which has a lower maximum temperature, will make it easier to avoid damaging your base. Place your skis or board flat and base side up and securely supported at the tips and tails, either in a vise or using blocks to hold the bindings off the table surface. They should be clamped or braced so they won’t move while you work on them. Pull up the ski brakes and use a thick rubber band stretched between the brake arms and over the heel piece to keep them out of the way. To apply the wax, hold the hot iron upright with the point or one corner facing down. It’s okay to let the iron actually contact the base, as long as you keep it moving. 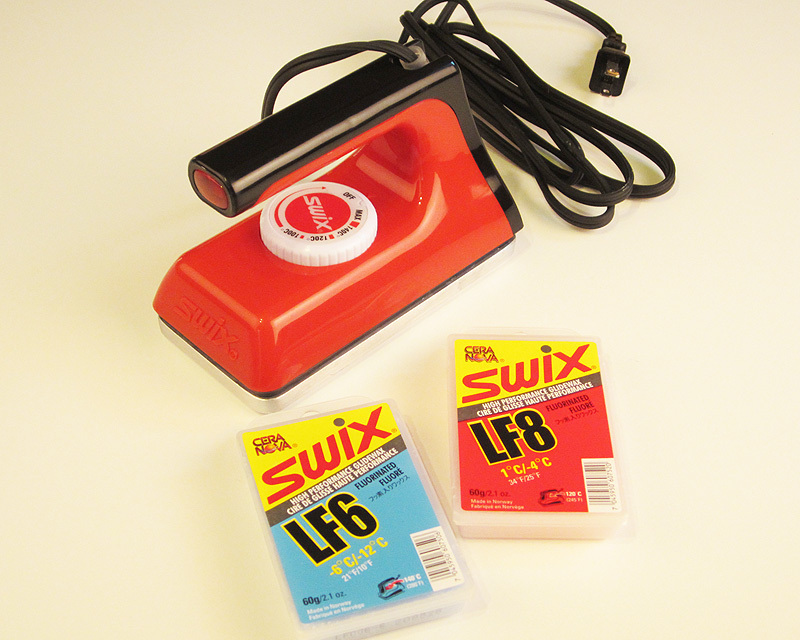 Press the wax to the iron and start moving it along the surface of your base immediately, leaving a thin trail of melted wax down the ski or board. You might be able to apply enough wax for a narrow ski in one pass, while a wider ski usually requires a down and back trip. For a snowboard or very wide skis, it’s usually best to zigzag down the base to cover the entire width of the board. It’s easy to apply more wax than necessary, so move fairly quickly during this step – you can add more wax later if needed. Applying the right amount of wax to completely cover the base will come with practice, but you’ll always have some waste. Next, put the iron to the ski base and move it down the ski to melt the bead of wax you’ve deposited on the base so that it spreads out evenly and penetrates the entire base surface. Remember that your goal is to get melted wax into the small pores in the base structure. Keep the iron moving at all times; usually a speed of about 1 - 2 inches per second will prevent damage to the base by overheating. If there are areas with no wax coverage, you can touch up by dabbing the wax on the iron quickly and then ironing over that spot again. Remember that P-Tex and steel edges retain heat for quite a while, so be careful not to linger too long when you revisit an area – it’s already hot. After the wax is applied, take a break and let the wax cool thoroughly. It’s best to leave your skis or snowboard at room temperature until the bases feel completely cool to the touch, usually about 30 minutes. If in doubt, wait a little longer; don’t rush the cooling process by taking the skis or board outside. If you scrape before the wax is completely cool, you’ll actually be pulling wax out of the small pores in your base, which is counterproductive. To get the wax layer that thin, you need to scrape off the excess. Both polycarbonate (plastic) scrapers and steel scrapers can be used for wax removal, but steel scrapers require a more skilled hand. If you’re just starting out, we recommend a plastic scraper, which should be sharpened regularly with a file or sharpener. The next step is brushing. 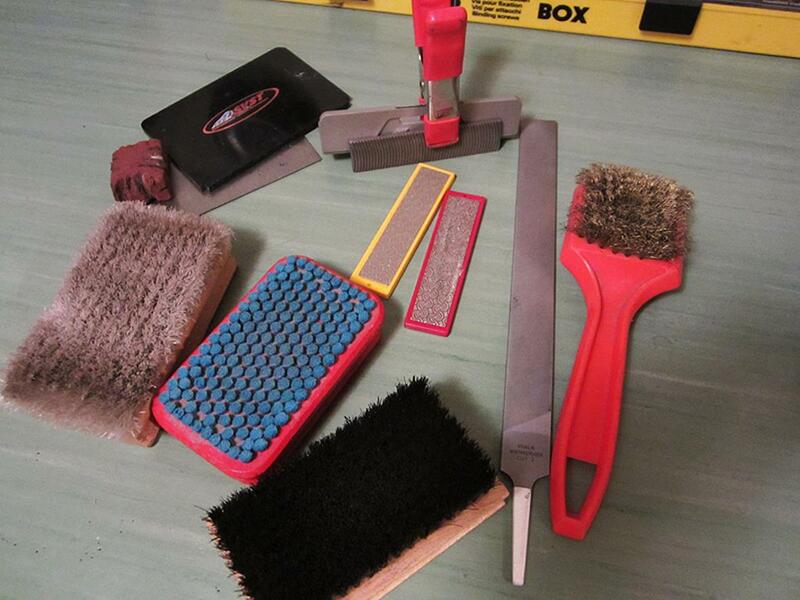 There are many types of brushes, and a complete waxing setup usually includes two or three different ones. A typical quiver of wax brushes usually includes a brass brush (for base structuring and prep), a stiff nylon brush, a softer nylon brush with shorter, finer bristles, and a very fine horsehair brush. You start with the stiffer, coarse nylon brush and progress to finer, softer brushes as you work. The idea is to leave only the thinnest layer of wax on the surface of the base and allow the structure (the fine texture of grooves and divots) of the base to show through. Wet snow usually calls for a deeper structure (created by a stiff nylon brush) to help break suction while colder, dryer snow calls for a finer structure (done with a soft horsehair brush). Snow with a medium texture calls for a medium structure and can be attained with a medium nylon brush. 6. Brush from tip to tail in short to medium strokes, and keep at it until the base is uniformly oily and glossy looking. As you work you’ll notice tiny white flecks of wax being deposited at the end of each stroke, even when it appears all the surface wax is gone – that’s the wax being pulled out of the structure to make you fast-fast-fast. It’s pretty hard to over-brush, but keep at it for five to ten minutes or so or until you get tired. Finish off with several full-length tip-to-tail strokes, and you’re ready to ride. Remember, you can’t wax too often and you can always do it over if you make a mistake (except if you burn your base). Some waxing is almost always better than none. There’s no better time to be fast than right now - what are you waiting for?